On the 8th August 2010, a mudslide occured in Zhouqu county, in southern Gansu province (Gannan Tibetan Autonomous Prefecture) in the PRC. The mudslide was 5km long and 300m wide, and up to 5m thick in places. 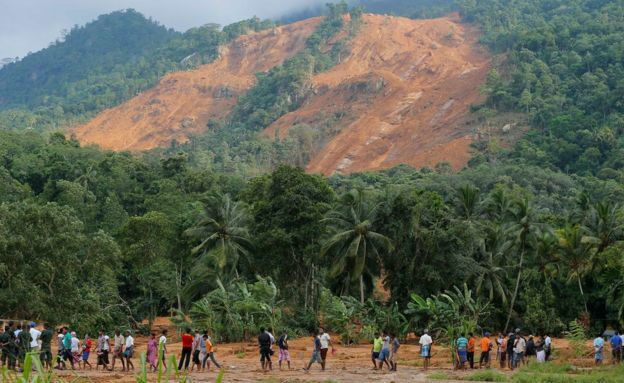 The mudslide was caused by a variety of factors, human and physical. Forests around Zhouqu had been cut down for mining and agriculture which lead to soil erosion and destabilisation of the slopes, as roots were no longer holding the soil together and trees could no longer absorb water from the soil, leading to faster soil water saturation. Despite the logging ban in 1998, trees continued to be felled. In the PRC, there had been 53 hydroelectric construction projects in recent years, with 12 just within Gansu province, where Zhouqu county is located. The dams have caused 750,000 tonnes of water and soil erosion and over 3 million cubic tonnes of bulldozed material, throughout the country. This has left the slopes weak and exposed to rainfall, allowing slides to occur more readily. Oscillations between the patterns of El Nino and La Nina (climatic events where air currents across the Pacific Ocean change, effecting the local weather systems among dozens of countries) caused unusually intense monsoon rains in 2010. Regions were receiving an extra 24 mm of rain above the normal daily rainfall. In ‘the largest downpour for a century’ 96 mm of rain fell in just one hour in the area. The earthquake in Sichuan two years previously created cracks in the rock face and destabilised the ground; Zhouqu county is very close to Sichaun province, so instabilities within Sichaun can very easily effect towns within Gansu, directly to the North. The 9-month drought which preceded the heavy rain had added to the weakness and instability of the soil, especially when followed by the heavy rainfall. 1,471 people died due to the slide. 1,200 people had to be rescued from the debris. 300 people were never found, and are presumed dead. 1,700 people who were evacuated from the immediate area were forced to live in schools. In total 45,000 people in Zhouqu county were evacuated. Medical care in the region was disrupted as 10 doctors from the Zhouqu People’s Hospital were among the missing. 66% of the county went without power, disrupting local businesses and transport. More than $40 billion worth of damage was caused in Gansu. Power lines were down in 2/3 of the county which had to be repaired. Wider infrastructure was destroyed at great cost. Mudslides throughout China in 2010 destroyed 8.76 million hectares of crops to be destroyed. The livelihoods of millions of people were entirely destroyed or otherwise decimated and China’s capacity to export was massively reduced. 300 buildings were buried under mud. A 3km temporary lake formed behind a blockage when the mudslide reached the local river at the base of the city of Zhouqu where the slide occured. This dam later burst causing further damage. The river was clogged with debris, damaging habitats and reducing biodiversity. 7,000 soldiers, firefighters and medical staff were deployed by the government. 20 speed boats and 4 helicopters were also mobilised. Gansu province received 120 million yuan ($17.7 million) by August 13th 2010. The PRC government promised local families $1,182 worth of financial aid for each victim lost. Tents, food and medical supplies were rushed to the stricken area but the remote mountainous location made access difficult. The governmentpromised to help rebuild homes and buildings in the affected area. A National Day of mourning was observed to help with the emotional trauma.